Zirconia and Thermo-paramagetic oxygen analyzers for combustion optimization, maintaining gas purity, controlling levels of CO2 in breweries and many other applications. Condumax II Hydrocarbon dew point analyzers ensure the quality of natural gas at custody transfer, prevent gas burner failure and the prolong the life of process equipment – helping companies save millions of dollars on repairs and down-time. Trace moisture in hydrocarbon liquids analyzers are available in explosion-proof and intrinsically safe versions and allow the continuous measurement of moisture content in a wide range of applications from catalytic refinery processes to pure hydrocarbons. Process moisture analyzers provide continuous on-line measurements of trace moisture in process gases and are available as explosion-proof, intrinsically safe and laboratory versions. 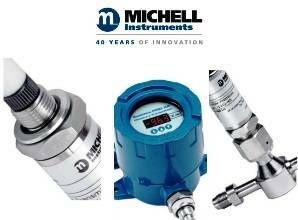 Michell Instruments has three manufacturing locations: Oosterhout, The Netherlands; Lyon, France and Ely, UK. The company has an extensive network of factory trained application engineers, subsidiaries and a network of distributors, including AMS Instrumentation and Calibration.